At Going Sign Company we take great pride in our long history of providing quality products with dedicated service. Our “hands on” individual approach has served us well over these last one hundred years, as is evidenced in that 90% of our business comes from “repeat” clients. We are grateful for our many regular customers and look forward to welcoming and nurturing new relationships. At the turn of the last century, John J. Going set up shop in a small storefront in Brooklyn, New York. He and a handful of employees specialized in painting letters on horse drawn carriages. 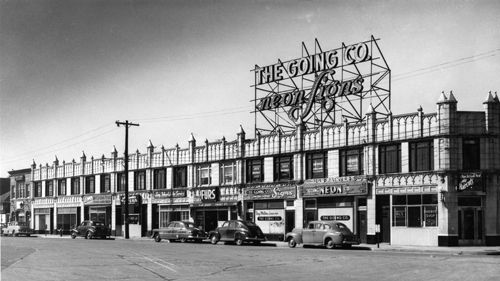 One hundred years later, a third generation of Goings owns and operates the business. Plainview, New York is the home base for over 25,000 square feet of office, manufacturing and storage facilities. The handful of employees has grown to forty and the size, scope and technology of the work has evolved (no more horse drawn carriages!!). Our state of the art facility is equipped with the latest machinery and materials. This equipment, used in conjunction with a motivated professional staff, enables us to meet any signage challenge. From your initial design to follow-up maintenance, we can be your one-source solution for all your signage needs. Whether you require interior, exterior, illuminated, non illuminated, individual signs or complete national sign programs; we have the capability, experience and the knowledge to meet your needs and expectations. We understand that successful signage is not only visually satisfying but its fabrication and installation must also fit within budget and time requirements. Finding solutions to meet the customer’s individual needs is our number one priority. We welcome the opportunity to speak with you about your business and any upcoming projects. Please feel free to call so that we can explore the ways in which Going Sign Company could be of service to you.